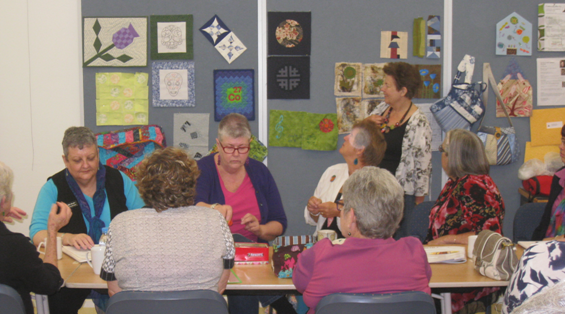 ROW makers meeting held on Wednesday 10 April | Canberra Quilters Inc. I love the fact that we’re getting over 40 people every month. Our room can comfortably accommodate that many. I expect there might not be so many when the weather turns nasty and the lucky one’s head elsewhere. But some of us will still soldier on! (Did I hear someone mumble “martyr complex”). I thought Wednesday’s meeting was really interesting. I appreciated the way people were sharing their design decisions. A little (!) bit more challenging than the first two months but I’m sure we’ll be able to push the boundaries. As you can see in the background we only have a couple of blocks/bags/ items each so far – it will build throughout the year. 40 people! What a fantastic group. If I didn’t have to work full time I’d be there with you.